(above) video of Lil’s NATCH 2 Jumpers Run. This was our sixth run on Sunday at the end of a 3 day trial. I was so thrilled at Lil’s enthusiasm and energy level. She got the job done with great pizzazz. (above) Lil’s Tunnelers Run. I loved this run. Lil was fast and her turns were super tight. Her YPS were over 5.50. I think she loved this run too. (above) one of Jake’s Touch N Go runs. NQ due to crossing the plane of the barrel and then circling it in the other direction but I was beyond happy I didn’t lose him at that point. This was his first outdoor trial of the season and something was clearly tempting him in the grass. Good boy for staying in the game. I’ll be uploading more videos of Jake and Lil’s runs. There were so many really nice runs, I can’t decide which ones to post. Lil and Takoda hanging out ringside at the trial. Jake was in the RV with Bruce at this time. I was so blown away that Takoda was so relaxed and quiet at his first outdoor trial and you can see how close our doggie neighbors were. He took it all in stride like he has always hung out at trials. He also did some amazingly precise heeling through oodles of dogs and people waiting to run. I was shocked he was able to remain focused in such a distracting environment. By Sunday he was playing and tugging with me as well at the trial as he does at home. This little puppy is so darned adaptable! So are his litter mates who were also at the trial. 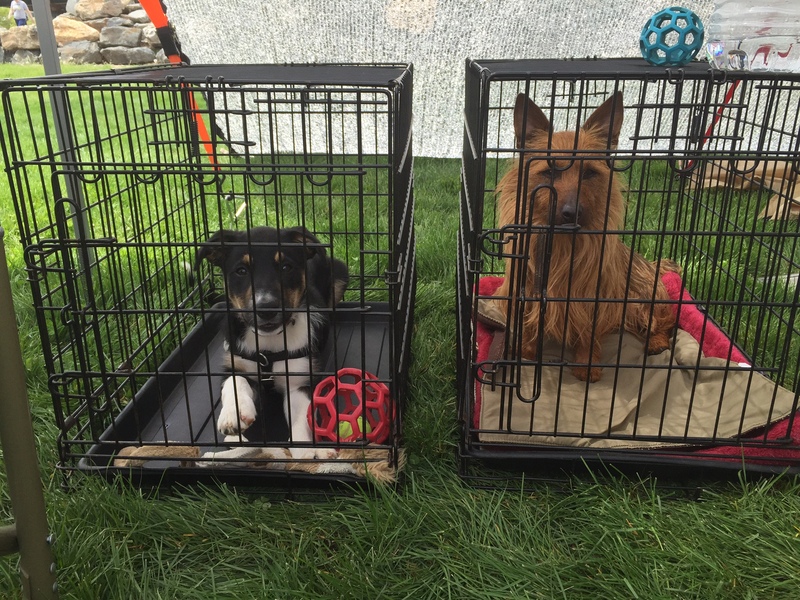 Jake and Lil’s first time running agility in an active horse barn…. fresh poop and all! Mountain Dog Sports runs great trials. The vibe is friendly and fun and they keep things moving along. 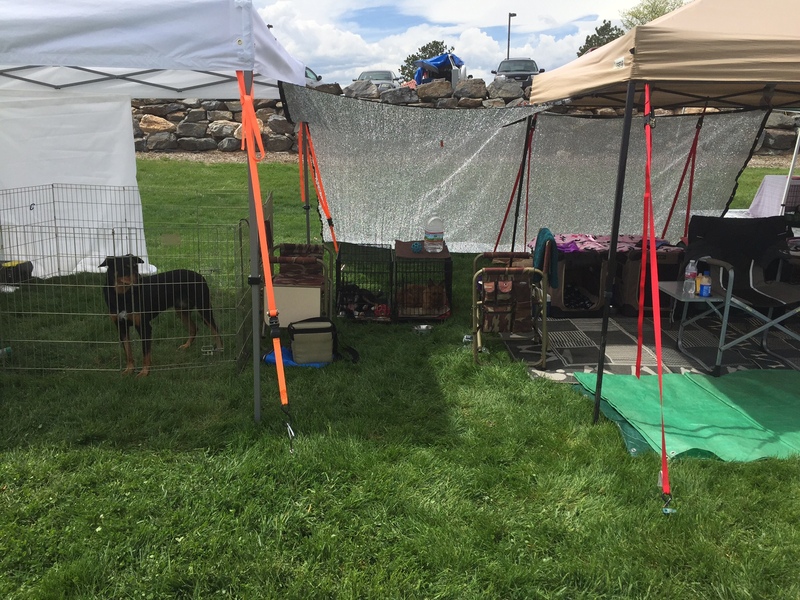 This weekend’s NADAC trial at the Adams County Regional Park was held in an active horse barn…. with mice, fresh horse poop and likely fresh horse pee too. Although Jake checked into the very popular “mouse hotel” in the far corner of the ring a few times over the course of the weekend 🙂 , he didn’t stay overnight (HA HA) and came back when I called and then continued running courses with great focus and speed. YEY JAKE! I think the fact that Jake stresses UP vs. DOWN worked well for him in this challenging environment. He had great drive all weekend long. Jake was totally amped when entering the arena and ring but he had great start line stays (except the first one). I attribute his success to playing all sorts of fun start line stay games away from agility over the past few months. 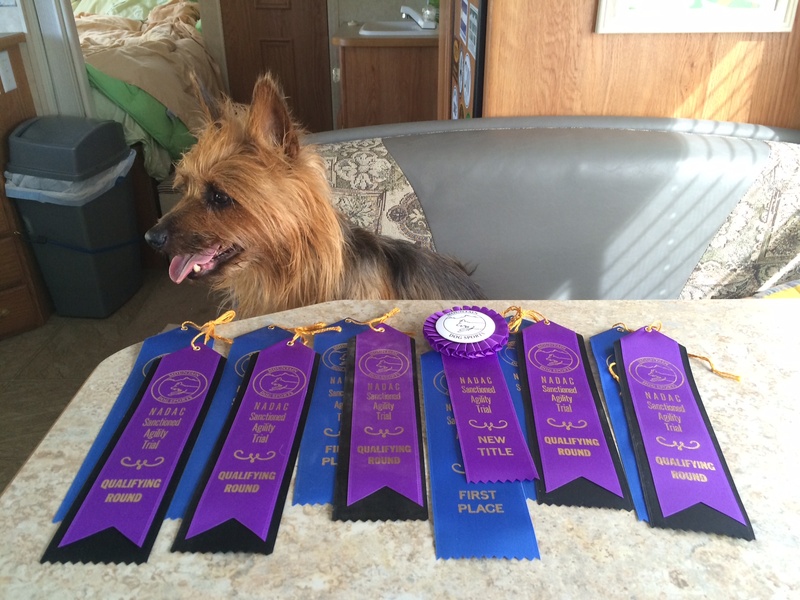 Jake earned his Open Chances Title and ran some beautiful Open Standard and Jumpers Courses. If he keeps running this well, I will continue to keep track of his qualifying runs for NADAC Championships. 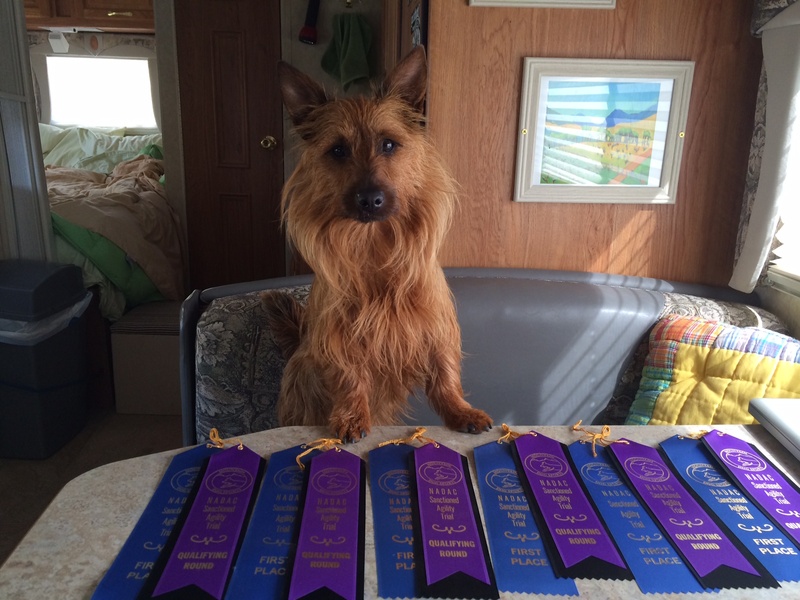 Jake will turn 10 this year and if he qualifies it would be so much fun to run both dogs at Champs in 2015. This is an exciting thought for me because a few years ago I thought his agility career was over due to an on-and-off again NQR (not quite right) but after three full days of trialing he is still looking great so I’m feeling optimistic about the upcoming year. 2) Lil is not as confident as Jake. As a result, Lil’s coping mechanisms in this challenging new environment were very different from Jake’s. On Friday (day 1) she acted concerned when entering the arena, and in the ring she looked insecure and lacked confidence which resulted in much lower drive than normal. She even stopped to sniff (a rarity for Lil) and it was not happy “investigative” sniffing. It looked more like “OMG! WHAT IS THIS SMELL?” sniffing. My best guess is the smell was horse urine since that area didn’t have any visible horse poop and a lot of dogs stopped to sniff the same spot. So the question I asked myself was: “What should I do about Lil’s reaction to this new environment? I didn’t think Lil was being a “bad dog.” I felt she was doing her best but she was too concerned about the environment NOT to check it out. I decided to sleep on it thinking she might work it out on her own overnight. I also decided it couldn’t hurt to walk her through fresh horse poop in the parking lot (there was plenty to choose from) while asking for attention. She quickly GOT that her job was to keep her head up vs. sniff or take a nibble of horse poop. Next I asked for some start line stay style WAITs while she was standing in the midst of horse poop and she quickly GOT that she should keep her head up in that situation too. After a handful of super short sessions (each session 2 – 10 seconds long) Friday afternoon and Saturday AM, Lil was offering attention while walking through or standing in the midst of horse poop, so I figured it was fair for me to say NO if she dropped her nose to sniff in the ring. And one firm NO is all it took to stop the sniffing but Lil still lacked confidence and drive when running courses. So I decided to run with her far more than I usually do and to run in a style that was as dynamic, upbeat, and as much fun as possible. It reminded me of how I used to run International style courses to keep her motivation and drive high. That seemed to work well and Lil ended up running much better….although slower than usual. Below is a video of Lil’s Elite Jumpers run on Saturday. It’s the only video we have from the weekend. Thank you Heather for video-iPading this run and for emailing it to me. (above) Lil running Elite Jumpers on Saturday. RE: speed and drive. Lil usually takes 4 or 5 strides between jumps (20-21′ spacing). In the video I counted as many as 7 strides between jumps but a couple of the jumps clearly had wider than usual spacing, which was consistent with the map (according to the course builders looking at the map). I could feel Lil’s confidence rise and her striding opening up as we ran this course and as a result her speed picked up considerably. This was her final run on Saturday and I think it was a real turning point. She ran better and faster on Sunday and acted more like herself again in and out of the ring. It was difficult for me to see Lil struggling so much with this new environment, especially because she is usually such a rock solid, trial dog but it was great to see her adapt over the course of the weekend. And Jake rising to the occasion and running so well helped keep my spirits up for sure. 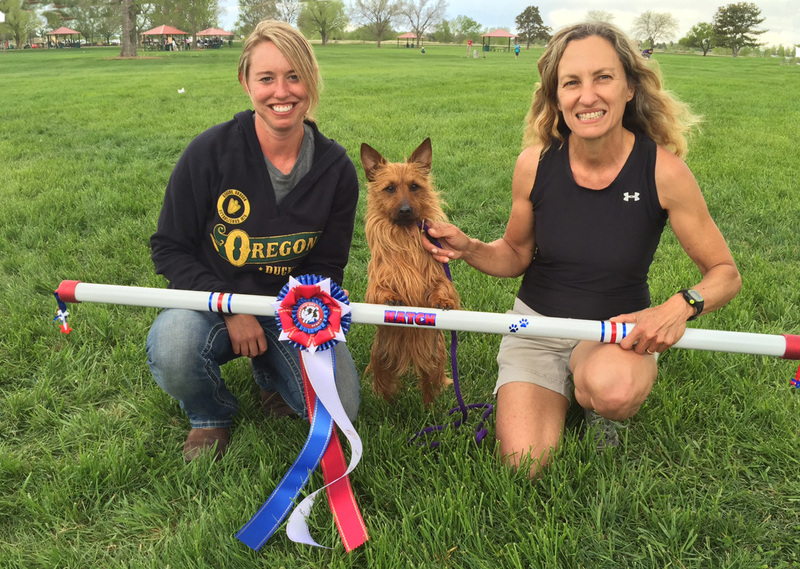 If the weather holds up, we are going to an outdoor trial near Durango, Colorado in 2 weeks. I think Lil and Jake will enjoy running on grass and being outdoors… and I will enjoy one last weekend camping in the RV. My fingers are crossed that this beautiful fall weather continues for a couple more weeks.